Chemists at Tufts University have developed the world's first single molecule electric motor, which may potentially create a new class of devices that could be used in applications ranging from medicine to engineering. 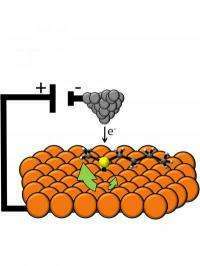 The molecular motor was powered by electricity from a state of the art, low-temperature scanning tunneling microscope. This microscope sent an electrical current through the molecule, directing the molecule to rotate in one direction or another. The molecule had a sulfur base (yellow); when placed on a conductive slab of copper (orange), it became anchored to the surface. The sulfur-containing molecule had carbon and hydrogen atoms radiating off to form what looks like two arms (gray); these carbon chains were free to rotate around the central sulfur-copper bond. The researchers found that reducing the temperature of the molecule to five Kelvin (K), or about minus 450 degrees Fahrenheit (ºF), enabled them to precisely impact the direction and rotational speed of the molecular motor The Tufts team plans to submit this miniature electric motor to the Guinness World Records. The research was published online Sept. 4 in Nature Nanotechnology. Credit: Heather L. Tierney, Colin J. Murphy, April D. Jewell, Ashleigh E. Baber, Erin V. Iski, Harout Y. Khodaverdian, Allister F. McGuire, Nikolai Klebanov and E. Charles H. Sykes. In research published online September 4 in Nature Nanotechnology, the Tufts team reports an electric motor that measures a mere 1 nanometer across, groundbreaking work considering that the current world record is a 200 nanometer motor. A single strand of human hair is about 60,000 nanometers wide. ...They're all different too,......have I missed something ? Is the work not sufficient, professor ? I love that these types of articles appear regularly. I've studied sub-cellular molecular motors (e.g., myosins and kinetochores) and I'm always excited to read about the advances made in those designed by humans. Given that this isn't exactly a novel concept, could we lose the tropes like "which may potentially create a new class of devices that could be used in applications ranging from medicine to engineering." That's just brutal writing. We should realize, the physicists didn't make any motor - they just observed the motion of molecule beneath the tip of STM (scanning tunneling microscope). Such motion has been observed many times before and now just the physicists invented a catchy PR name ("a molecular motor") for this effect. It's the same situation, like the calling of fiber rotating under influence of statical electricity of your charged sweeter "a motor". This "motor" is not driving anything and it cannot be used for doing anything usable at the present stage of technology. "Molecular motor" is not a PR term. It's a term used to describe any of a superfamily of usually protein complexes that drive motion of create force within a cell and, now, in laboratories. The sliding filaments of the skeletal muscle contractile apparatus function by controlling and harnessing movement of myosin, a motor protein. Flagella that confer locomotive ability to bacteria and sperm are powered by a motor whose parts are analogous to most man-made mechanical motors (http://www.youtub...xRYx82Gk for example). When you consider the size of the machine providing the current and doing the observing, I'd hardly call it a molecular motor!!! When they can hook this "motor" up to an equally sized power system, THEN they can go in the guiness book of records!! !